As MoviePass season has heated up, I've been slacking on my reviews. I'll start this post with five very quick takes on movies I've seen within the last month. 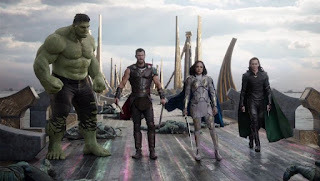 Thor Ragnarok is the third stand-alone Marvel film, matching Iron Man and Captain America as the only three-time solo acts in the Marvel Universe. As much as I like Chris Evans as Cap America, I really enjoy Chris Hemsworth's take on Thor the most out of all Avengers outside of Tony Stark. This time around, Taika Waititi is at the helm of this action-comedy extravaganza and he brings a quirky sense of New Zealand humor to this film. Set as a follow-up to the events of Avengers: Age of Ultron, Ragnarok begins with Thor battling a fiery monster. Asgard is trouble once again and a few of the Avengers show up in support including Dr. Strange, Hulk and that meddling brother Loki (played with glee by Tom Hiddleston). A funny and surprising cameo turns up in a play about Loki and Thor and the stage is set for a lot more fun along the way. After a devastating visit from Thor's evil sister Hela (played with extra campy venom by Cate Blanchett), Thor and Loki end up on a scrap-filled planet where Jeff Goldblum plays the Grand Master who runs a sort of large-scale Fight Club. Goldblum's signature delivery fits in perfectly with the Waititi tone of the film and it's on this planet where we see Hulk and Thor hook up. The humor surrounding Bruce Banner (Mark Ruffalo, who gets a lot more to chew on here than he does in other films) and his long-term turn as the Hulk become a topic of hilarious back and forths between Thor, Banner and Valkyrie (a new supporting character). While Ragnarok is definitely a Thor vehicle, we get a whole lot of the big green guy and there is a lot of quality character building that should set things up nicely for the next Avengers film. The story flows well and the movie never shows it's 2-hour plus run time. Great visual effects, a solid rocking soundtrack and quality acting all around. Nearly everyone is extremely likable in this movie. Waititi himself lends his signature Kiwi voice to Korg, a CGI stone man who looks a lot like a smaller version of the Rock Biter from Neverending Story. Korg calmly delivers his lines and brings an extra layer of off-beat wit to the movie. From early on in the film it's clear that Waititi has planned to load the dialogue with a bunch of deadpan delivery and self deprecating humor. There is a sequence near the end of the film where Ruffalo as Banner jumps out of a spaceship. The resulting scene brought my half-full theater to a full roar of laughter. Once Led Zeppelin's Immigrant Song blare during the final battle, the whole audience is on-board and loving every minute of it. This is easily my favorite Thor film and one of the best Marvel superhero movies ever made. 5 out of 5 JRs for the 6th time this year. I really hope that Waititi gets a chance to do more in the Marvel universe as his style certainly fits well in the comic book genre. Black Panther is next (MICHAEL B. JORDAN + RYAN COOGLER!!!) and then we get our first taste of part 1 of Avengers Infinity War next May. Marvel is doing such a great job of building all these characters in the stand-alone films that it's quite obvious we need a super-sized two-part Avengers feast the next time around. I recently heard some experts tout that this is a down year for movie quality overall. I respectfully disagree. The year started with SEVERAL totally awesome films and we've gotten some gems over the Summer and Fall as well. It'll be interesting to see if any quality Oscar contenders emerge over the next few weeks.